Two brides live side by side in Tyneham House, each in her own century. 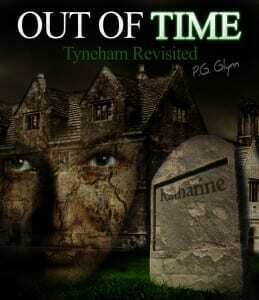 Katharine, married to Arthur in 1543, is freer to move through time than Catherine, who in 1943 is married to Jeremy. Writing in this genre became, unexpectedly, quite a ghostly affair! One thing kept leading to another until the novel was ‘there’. Throughout the process, I had a tremendous sense of being driven to tell the story of Tyneham – albeit a fictionalized account! There are many truths in there too. Simply write, without waiting for ‘inspiration’ to strike! Develop a small idea, letting it grow in its own time, and then write a synopsis of it – excitedly, as if this is an actual happening you’re telling to your best friend. Create ‘potted biographies’ of each main character, until you know them through and through, before starting on your first draft. At this stage, I aim for 1,000 words a day – and then I write several further drafts until the novel ‘lives’. P.G. Glynn lives in the quirky ancient town of Totnes, close to glorious Dartmoor and not far from the sea at Torbay and Dartmouth. She is inspired, (and tries not to be daunted!) on her morning walks beside the Dart, by the knowledge that Agatha Christie could see this same river from her holiday home – Greenways – and that Sir Arthur Conan Doyle is said to have set The Hound Of The Baskervilles on Dartmoor. A snippet in my local newspaper, when I lived in Dorset, about Tyneham – a village that had died. How had it died, I wondered – and why? I was soon firing on all cylinders, trying to find answers – by no means an easy task at that time. The story behind the story grew and grew, over several years, and is now documented at the end of the novel. I’ve also spoken of it on my website.